‘Whole Cloth’ is a type of quilt designed to display the quilting stitch. It is beautiful in a simple fabric like silk, with lots of swirls and delicate designs. I am only half-way there. Many of my quilts are soft paintings, with a central silk painting bordered by strips and binding. For 2015, I am working toward more emphasis on the quilting stitches. But I can’t quite give up drawing and painting on the cloth–raw silk in either black or white. 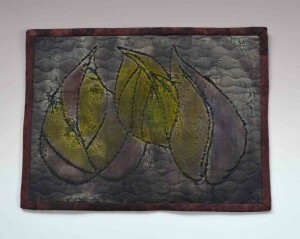 Both of them began with a simple drawing of leaves on the silk. I stitched the outline of the leaves before working with color. For the small black quilt (Shades of Silk) I discharged the black dye and then added additional silk paint colors. The hand-stitched black thread and the machine quilting were added after the color. 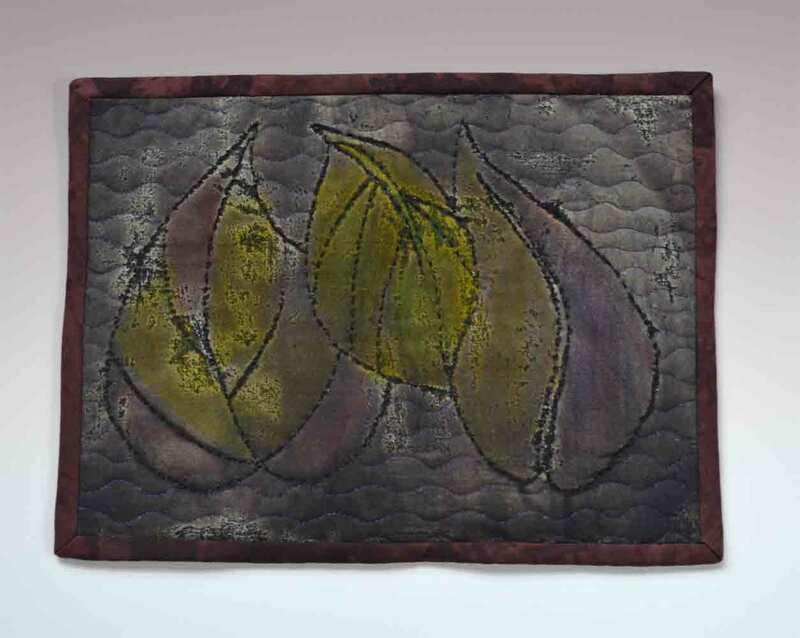 The texture was created by the amount of dye discharged, and by the rough hand of the raw silk. 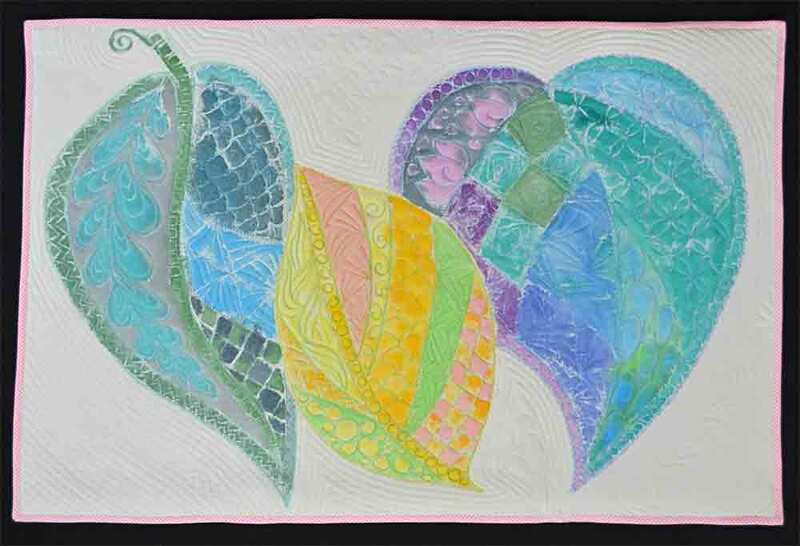 For this much larger quil t on raw silk (‘Pastel’), I also drew the leaf outlines and then machine-quilted them. I filled in each section with more detailed quilting before adding color. For the color application, I used a dry brush technique to create a grainy texture on the raw silk fabric, using both silk paints and regular heat-set fabric paints. 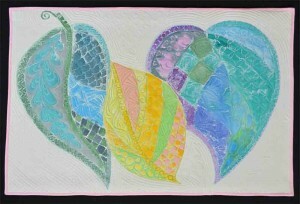 When I was satisfied with the color, I went back and finished outline quilting around the leaves. This quilt has a very matte surface, like a painting in pastels. I used several quilting patterns that I learned drawing Zentangles®. Infilling is a traditional task of quilting. Drawing Zentangle patterns has given me more confidence with the quilting stitches. Every painting I have ever done looks like a study for a quilt. I realized this week that it is because my sense of color comes from the fabric store, not the paint tubes!